The development of a mobile app is a vast subject which needs detailed research and planning, but without knowing what your users are looking for, it becomes a garbage bin, where different sets of functionalities and features are dumped, without knowing their destinations. I know am sounding way too rude, but actually, this happens to a mobile app when it is crafted without thinking what your users want from a mobile app. Business owners across the globe are so stressed out to beat the existing competition through any possible marketing channel, but in the rat race they miss the significant element, which drives any business successfully, that is USERS. Just visualize downloading a mobile app, which serves every other purpose, but not what you are looking for, then simply the app will meet its fate through uninstall. 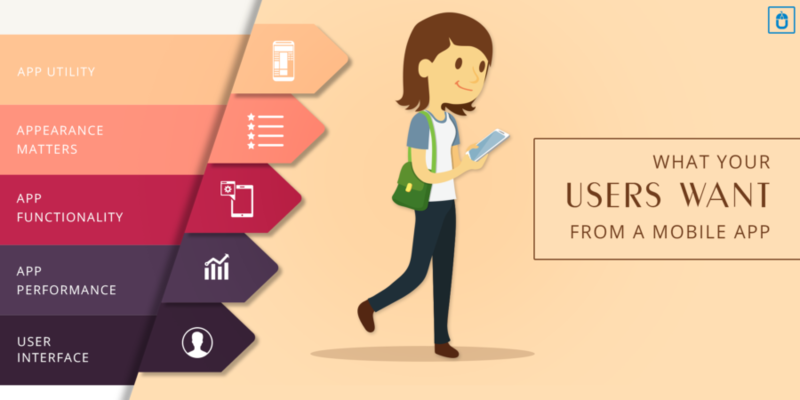 I have noticed many times, that companies promote their apps showing the bigger picture of their functionalities and features, but they miss to showcase that how these features would help the users in simplifying their daily routine. If your user is unable to connect to your mobile app then, no matter what the functionality and features it serve, it will all go blank on user’s mind, and they may pick a simple Jane over your diva app, so when you shout aloud for your mobile app, then make sure, that you portray how users can benefit from. Many mobile apps exist in the app store which are truly magnificent, but they never caught the attention of larger user base due to the poor appearance, when I say appearance, then your users want, something which has great functionality, features and appeals them, if not, then sorry to say, but your mobile app can never gain good traction. Invest some time in color scheme, content placing, icon and every other detail which would turn your app into a visual appeal, do not rely on simply on your app functionalities to save you from any disaster. Yes, app functionalities are a significant part of the mobile app, which let the users utilize the services, through a perfect medium. If your app functionalities are not different from your competitors then what special does it have to sell itself? It’s very blunt and upfront speech, but if you want your mobile app to succeed, then ensure that it ought to have different functionalities from your competitors, making it much in demand in the market. When your user downloads a mobile app, they only one expectation they have apart from the above-mentioned points, and that is the app performance, believe me on this, if your app is crashing, has bugs, had unnecessary adverts, then nothing can save your app from the destruction. Ensure you invest pretty good time in testing the app on various devices and not putting the ads at least in the very first version of your mobile app, this altogether turns into an unrepeatable disease for your mobile app and no technical medicine can cure the disease. It sounds so funny when certain app developers to create a mobile app with a complex or at least a not-so-easy user interface, thinking that this feature would grab the attention of users, but unfortunately, it leads to the mournful ending, where evolving again is an impossible task. Don’t expect your users Computer Science graduates, who are ready to solve the puzzle of your mobile app riddle, they are users, from different backgrounds, but the same expectation to access your mobile app with an ease, so don’t serve your users what you want, but serve their plates with what they want. It is a little sarcastic, but I would love to mention here that, your mobile app is not Harry Potter movies’ Phoenix, which evolves from its own ashes, after periled to death, but it is a one time and click the deal type of arrangement, where your mobile app needs to excel in the very first go and needs to impress the users from every corner, to survive in its particular business domain. So pay attention to your app, but most importantly pay attention to WHAT YOUR USERS WANT from your mobile app, do research , do planning, find out what your competitors lack in, search the best possible way to improve the user experience, these efforts would pay off as the success of your mobile app. I hope every mobile app development company would follow these instructions and guide their clients to develop a mobile app fitting the requirements of their end users.